Don Reed, whose solo show, “That Don Reed Show,” can be seen at the Marsh in Berkeley through April 28th, and then later at the Marsh in San Francisco, is interviewed by Richard Wolinsky. Growing up in Oakland set the stage for Don Reed’s breakout one-man show, “East 14th,” and his local heritage remains a key part of his work. 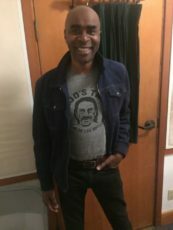 A stand-up comedian, actor on television (currently in Amazon’s show “Bartlett”), his vocal talents are also heard on various animated programs. He’s performed on Jay Leno’s Tonight Show, and served as the warm-up comedian for several television audiences. But he always returns to The Marsh, where he got his start. An extended version of this interview can be found as a Bay Area Theatre podcast. Also: A review of the play “Her Portmanteau” by Mfoniso Udofia, which is playing at ACT’s Strand Theatre in San Francisco through March 31, 2019.